SANTA VISIT TO THE CLUBHOUSE – Once again Santa’s visit to the Clubhouse for our annual Christmas party was a great success. A lot of work goes into organising the big day and thanks so much to everyone who helped in any way. Most of all thanks to you the parents and children for coming out in huge numbers and making this such an enjoyable evening. A special thank you to Santa, he listened to all sorts of requests for the big day, we’re sure he won’t disappoint. LOTTO – Play our Smart Lotto on line by clicking on http://bit.ly/StMarysKiltoghert Tickets cost €2 or you can enter a yearly lotto at a discounted rate of €80 which enters you into 52 draws. The Jackpot currently stands at €10,000. 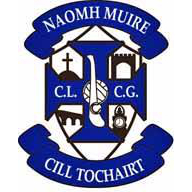 ST MARY’S ON-LINE SHOP – To purchase club gear please visit O’Neill’s website-GAA-Ireland-St. Marys Kiltoghert GAA or go to the shop on our Facebook page. SCÓR NA NÓG 2018 – The Scór na nÓg Connacht finals will take place on Sunday 13th January in Claremorris. St. Mary’s will be represented in the Rince Foirne by Emma Morgan, Áine Morgan, Nicole Glancy, Grace Duignan, Rhianna Ward, Kaneisha Beirne, Sienna Beirne and Thomas Connorton, Aithriseoireacht by Michael Connorton and Bailéad consisting of Ava Brogan, Roisin Noone, Elsie Harman, Eleanor Smith and Rionach Nic Conmara. Club AGM – The 2018 Club AGM took place in the clubhouse on Saturday last 8th December. Thanks to everyone who attended. BERNARD MURRAY WALK/RUN – Please keep the date free in your diary as we come together to support the Murray family and celebrate the memory of Bernard, a dear friend, colleague and loyal community man with the annual Bernard Murray 5K memorial walk/run on Thursday 27th December. Registration from 11am, starts at 12.30pm. All proceeds go to charity. GALA DINNER – We are delighted to announce that tickets for the club’s Gala Dinner on Saturday 2nd February 2019 are now available. This will be a night of celebration in The Landmark Hotel where we look forward to 2019 full of optimism and will include presentation of medals to our Intermediate ladies and U20 boys teams. It will include a 4-course dinner and music by the ever-popular band Late Night Radio. Tickets for the Gala Dinner evening are priced at €35 per person. The club welcomes the opportunity to sell individual tickets or a table of 10. There will be some wonderful prizes given out on the night. For more information, or to purchase tickets please contact Paula Butler 087 2480670 or Maureen Diffley 086 390 7092 or private message our Facebook page.